I'm one of those people who has several alarms spaced 15 minutes apart. During the week I have to be up by 730 most days, excluding Wednesday which is 630. Weekends I have to be up by 530. I typically go to bed somewhere around 9-10. I need to start a morning, and evening, routine. I have a plan laid out and figured I should share. Wake up - no more hitting snooze! Stretch - stretch arms, legs and do some squats and side stretches. Make bed - I usually leave it a mess but I've heard making it is good for motivation first thing in the morning. Check food and water for Lucy - I do this anyway, but Lucy (my cat) stays in my room, so I make sure she has enough food and water for the day. Scoop litter box - I need to get better at scooping more often and a clean litter box is best for everyone involved. Bathroom - I do this anyway too, but obviously going to the bathroom first thing is good. Splash face? - I've read that it's helpful with waking up and tightening pores. Wash face - at the very least with a makeup remover wipe. Drink a glass of water and take medicine - I have two pills I take every day, an allergy pill and my thyroid pill. I usually take them with the minimal amount of water, but I'm going to start drinking a full glass of water every morning. Eat breakfast - the only change here is what I'm planning to eat. I had an argument with my sister about this sort of thing. I've decided to stop buying breakfast every morning and just get yogurt or something. It's healthier anyway! Eat dinner - because of the aforementioned argument I'm not sure how this will go, but obviously dinner is important. Bathroom - we only have one bathroom, and Amanda has an annoying habit of getting in there and playing on her phone for a half hour to an hour! I sometimes wait, if I really have to go, but I usually just go to bed. I've had far too many mornings where I have to pee so bad it hurts, so I need to start going before bed. Wash face - again, at least with a makeup remover wipe. Check food and water for Lucy again - sometimes I have to refill her water dish, her food is usually fine for the whole day. Scoop box - same as morning routine. Stretch - I think stretching before bed can be a good thing, too. Bed - I want to really focus on going to bed and putting my phone away before 930pm. I think these are easy enough to do, I just have to remember to do them. I'll update in a little while to see how well I've done. I'll also see if I need to add or adjust anything. 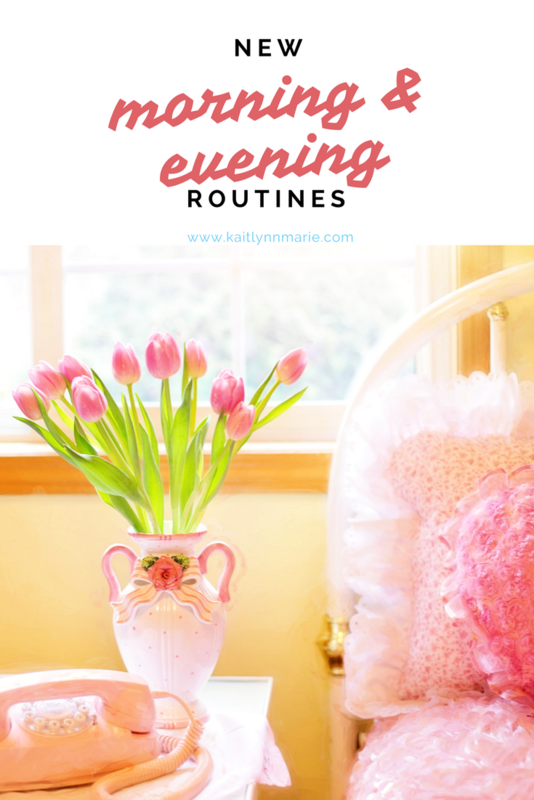 Do you have a morning/evening routine? Does this sound like a good routine to start? Let's chat in the comments! 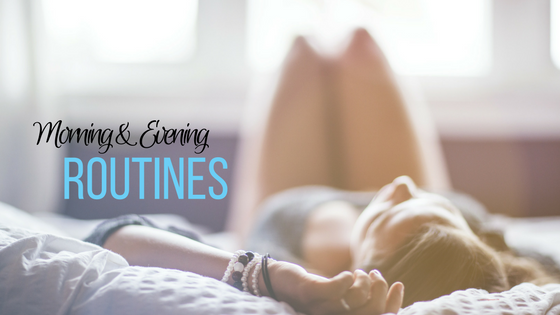 My morning and evening routines vary so much. Lately my evening routine has been playing xbox until I get tired and then go to sleep. Haha. I think I've almost perfected my morning routine! Keep in mind I have a 3 year-old so all of this has to be done before she wakes up. 4:30- Wake up. You pretty much have to jump out of bed so you don't hit the snooze! I read my Bible, drink coffee, and check email/blog stats. 5:00-6:00- Blog work, mostly writing as that's my most productive time. 6:30-7:15-ish - Shower, maybe breakfast, then I tend to pace the living room to get steps while I get caught up on social media/Pinterest. Oh man, that's much more intense than mine haha!